In the early morning hours on July 4th, 1986, 21-year-old Lance Corporal Howard A. Foote Jr. climbed a ladder leading into the cockpit of an A-4M Skyhawk. He started the jet up, taxied to one of Marine Corps Air Station El Toro’s runways—which was unlit at the time—and pushed the throttles forward. Moments later, the Lance Corporal would realize his dream to fly a tactical military jet, albeit just once and illegally. As news reports at the time recount, Foote flew out toward San Clemente Island, executing loops, rolls and high-speed maneuvers before turning back to MCAS El Toro after about 45 minutes to attempt a landing. This time, the runways were all very well lit and the base was buzzing with activity due to his “borrowing” of the jet. Just months prior to his Skyhawk caper, he tried to set a glider altitude record that resulted in an aerial embolism. Due to the nature of this injury, he was told he would never be able to fly for the military. The news crushed him, so he became a fast-jet pilot on his own terms just days later. The path that got him flying a glider at 41,000 feet, which caused the embolism and eventually commandeering a Skyhawk, was a strange one. Foote befriended the Marine Crops general who commanded MCAS El Toro at a glider base in the Mojave Desert. The General was also a keen glider enthusiast, and Foote was a talented pilot with loads of potential. Apparently, the General Bloomer tried to get the altitude record flight to be a Marine Corps sanctioned event, but he could not get approval. A pressure suit would had likely been provided if he had, which would have made the attempt much safer. Also speaking to the L.A. Times, the General reflected on what had happened. “I would encourage him to get a college education,” Bloomer said. “There are a lot of other things he can do in aviation besides being a fighter pilot. He could become an engineer or go into aircraft manufacturing. General Bloomer retired from his position as the head of MCAS El Toro just days before Foote stole the Skyhawk. Aside from his time in gliders, Foote was also said to have had about 100 hours of A-4 Skyhawk simulator time. With what he knew about the jet in order to maintain it, along with his strong natural flying skills, it was enough for him to pull off the late-night fantasy flight and live to talk about it. Yet the jet used for the adventure, which belonged to VMA-214 “Black Sheep” at the time, was discovered to have been unsafe for flight. During testimony surrounding the case, it was noted that the jet’s ailerons were out of alignment and that its nose-gear steering was not working properly. Both factors that made Foote’s flight that much more dangerous. 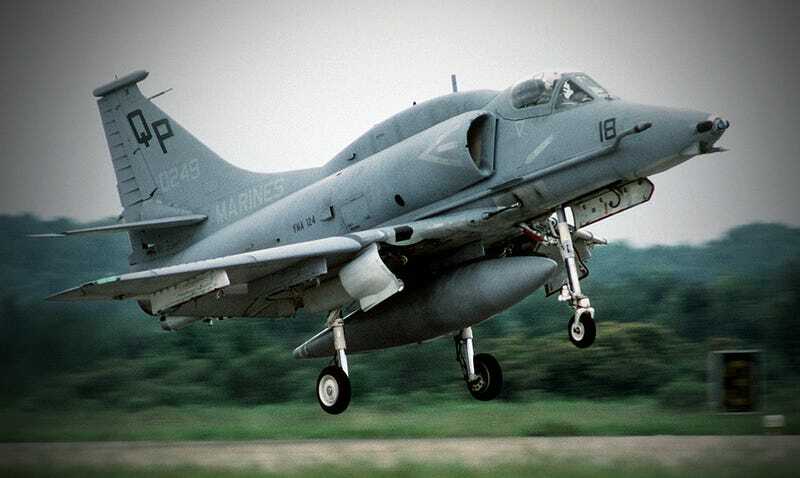 A load of charges were brought against the Lance Corporal, including misappropriating the truck he used to get to the aircraft and the Skyhawk itself, as well as damaging an aircraft and disobeying regulations. He was also charged with hazarding a vessel, flying without proper training or approval and recklessly disregarding the plane’s mechanical condition at the time of flight. Many of these charges were dropped, but Foote still could have faced nine years of hard labor, forfeiture of all pay, demotion to private and a dishonorable discharge. In the end, none of this occurred. In November 1986, Foote received four-and-a-half months already served in the brig, and an other-than-honorable discharge from the Marine Corps. It was a remarkably light sentence for such a dangerous and selfish act. But Foote had been a stellar Marine, with absolutely nothing on his record prior to show a pattern of misbehavior or irresponsibility. The General’s influence on him, and his injury in relation to it, was likely factored into the sentence. After trying to apply to the Israeli Air Force to fly fighters, Howard Foote Jr. went on to become a civilian test pilot and engineer, working on various projects over the years, including a microwave airplane concept and projects for NASA. Not bad for a guy who stole an operational fast jet from the Marine Corps.